All praise is for Allah, Lord of all the worlds, and blessings and peace upon His servant Sayyiduna Mohammed (sall-Allahu ‘alayhi wa sallam), upon his family, his companions, his wives and those who follow them for the best until the Day of the judgment. Shah Waliullah muhaddith dehalvi [rh] writes in his book ‘Al Intibah fi Salasil ul Auliaullah’ that he received the ijaza [permission] in Sattariya silsila [ tariqa] He gives the chain of this ijaza contaning names of different scholar including Ghaus Gwaliari who was the chief of Sattariya silsila in India. Shah Waliullah writes that through this chain he received the’Aurad and wazaif ‘ of Sattariya silsila which includes Dua e saifi and Jawahir Khamsa. Dua e saifi is a supplication which is taught to mureed by a shaykh who has ijaza to recite and teach this dua. The last part of Dua e saifi consists of Nad e ali which has words like “ Ya Ali , Ya Ali , Ya Abu Turab”. Do wahabis need more clear evidence for Istighatha? Wahabis should now stop projecting Shah Waliullah as ' [pseudo] salafi. And if they agree to his aqida then wahabis should stop calling muslims as mushrik . Jawahir khamsa is a book of different dua ( supplication ) . This book also consists of Dua e Haidari . The last part of Dua e haidari consists of “ Ya Ali , Ya Ali , Ya Abu Turab”. Let the wahabis take a note of this and declare their wahabi ruling on Istighatha upon Shah Waliullah. Jawahir Khamsa is easily available in book shops. So it is clear that Shah waliullah and his shaykhs recited dua containing ISTIGHATA words. Also note , that Shah waliullah writes in his book Anfasul Aarifeen that his father ( who was also his shaykh), Shah Abdur Raheem [ Rh] not only used to celeberate mawlid every year but also did “niyaz” on food on that occasion. In the same book Shah Waliullah (rh) writes that his father shah Abdur Raheem went to his teachers grave and recited Quran. After he recited a part of a sura from quran , a voice came from a different grave saying” that is not my grave. But complete your recitation and then come here”. So Shah Abdur raheem recited quran on both the graves one after the other. Jawahir Khamsa is a collection of many dua (supplication) which is recited by the sufi shaykh of almost all tariqa in subcontinent. 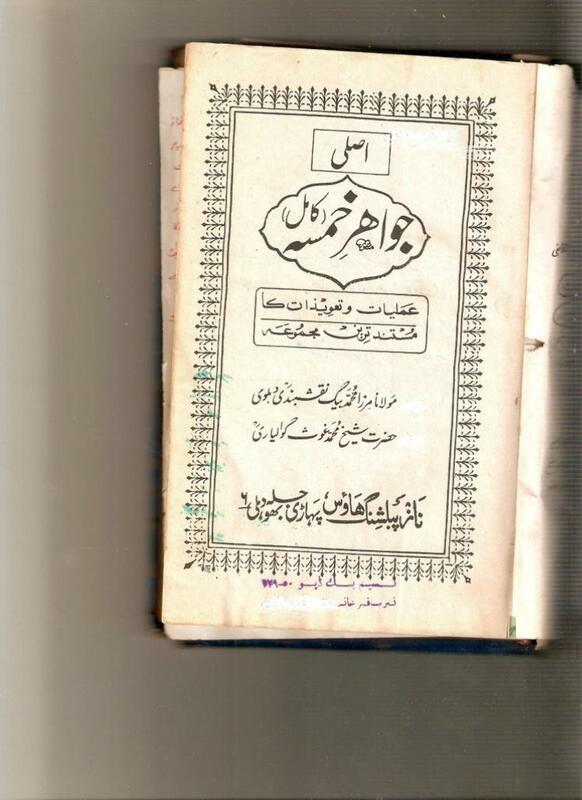 Jawahir Khamsa was compiled by Shaykh Ghaus Gwaliri. He wrote the foot notes and remarks to each dua in Persian language. It was translated into Urdu by many people . 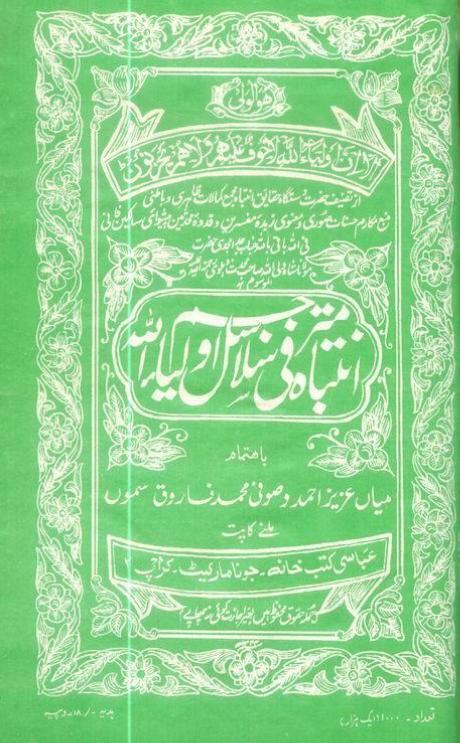 The urdu translation of Mirza baig Naqshbandi is the most famous one. One such dua in jawahir khamsa is ‘Dua e saifi”. There are many rules and conditions for reciting Dua e saifi and one such rule is to recite NADE ALI before reciting dua e saifi. As per the “nukaat’ of this dua , nade ali has to be recited a fixed number of time before starting Dua e saifi. Also after completing dua e saifi, nade ali has to be recited. So any one who recites dua e saifi , first recitec nade e ali. Any one who gets ijaza to recite complete jawahir khamsa gets permission to automatically recite nad e ali , as nad e ali is one of the dua ( supplication) included in jawahir khamsa. Scan from jawahir khamsa showing nade ali is included in it. This dua is a special dua of Chisti-sabri tariqa . But sufi shaykh of other tariqa also recite it. As per senior sufi shaykhs this dua should not be recited by normal people. See the scan from ‘ Anwarul uyoon” which is malfuzat of Shaykh Shaykh Al Alam Abdul haq rudauli ( radiallauhu ta’ala)..
See Dua e haidari from this book. Please note that Shah Waliullah muhaadith dehalvi [ Rh] writes in his book Al Intibah fi Salasil ul Auliaullah’ that this faqir ( shah waliullah uses this for himself) recieved "khirqa" ( sufi cloak) from shaykh Abu Tahir Kurdi[Rh] and also the 'amal" ( special way of reciting ) mentioned in Jawahir Khamsa. Shah waliullah also recieved his sanad ( certificate/ chain) of Hadith from Shaykh Abu Tahir Kurdi al Makki , when shah walilullah spent time with shaykh abu tahir in makkah. Shah waliullah then passed this ijaza in hadith to his son shah abdul aziz muhaddith dehalvi (rh) . The shaykh e kul of the wahabis in India , Nazeer hussein dehalvi learnt hadith sciences from Shah Ishaq dehalvi. Wahabis should stop calling shah walillullah as ' mushrik" for reciting Nad e Ali ,as this will also make Shaykh Abu Tahir kurdi al makki also as a mushrik. Alos note , Al Intibah fi Salasil ul Auliaullah’ is in TWO PARTS. In the second part he has mentioned his chain in hadith and fiqh. Shaykh Abu Tahir kurdi al makki was not a shia nor was Shah waliullah muhaddith dehalvi.You can check names of other scholars in the scan who used to recite this. All of them were sunni scholars. Nade Ali has words like ' Ya Ali". When a sunni uses these type of Istighatha words he does not think Ali (rd) or Shaykh Abdul Qadir gilani (rh) [ Faisala Haft masla] or Shaykh Zarooq (rh) [ Busta al muhadditheen] or Sayyid Ahmad bin Alwan (rh) [ Raddul Muhtar] can help them directly. Shias have different sects and few of them place Hussein (rd) above Ali (rd) . Others think Ali (rd) is higher than prophet. They place their complete trust in Ali (rd). Question: As per a hadith if some one is alone in forest and he has fear of Lion ,then one should say YA DANIYAL (alayhis salam)help me. Is this permissible or not ? If this type of Istighata is permissble then will it constitute shirk? Answer ( By Shaykh Gangohi) :IF this narration is correct then this means Allah has placed this effect in the name of Daniyal alayhis salam. There is plenty of article on sunni understanding of Istighata already posted on main marifah website as well as forum. Those interested can read. This practice of Istighatha by great scholars is a clear proof that it was never called shirk before Ibn Abd al wahab najdi al tamimi started his wahabi movement. Shah waliullah muhaddith dehalvi [Rh] wrote ] atyab un naghm fi madh sayyidil arab wal ajam ( Arabic). It is a book in praise and love of prophet [ Sal allahu alayhi wa sallam ]. He also wrote commentary to this book in Persian language. “ there are many matters in which to seek help from the blessed soul of prophet ( sal allahu alayhi wa sallam ) is necessary.